Anish Kapoor (born in Mumbai, Maharashtra, India) is a famous Artist from India, he is 65 years old and still alive, born March 12, 1954. 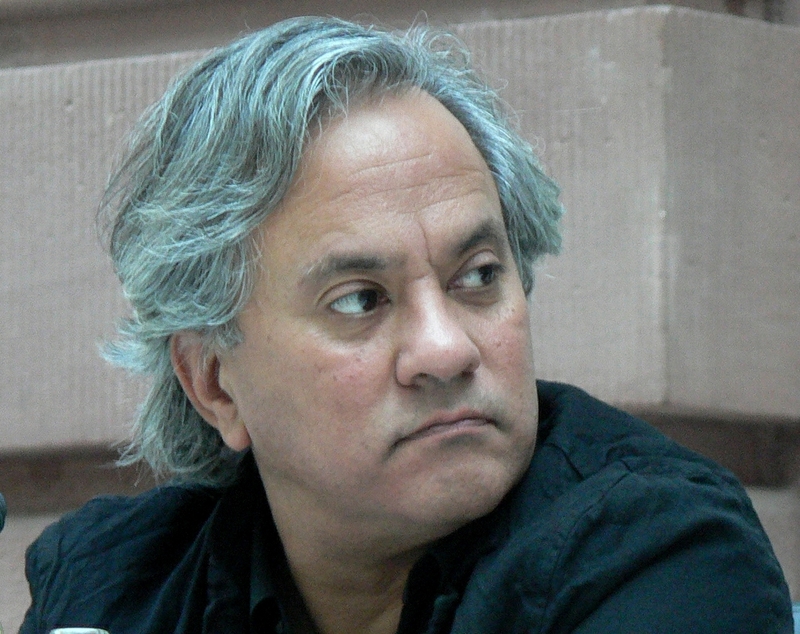 Anish Kapoor, born in 1954 in Bombay, India, is a sculptor, living in Bristol, UK. Kapoor moved to Britain in 1972 where he studied at Hornsey and Chelsea. He says he is influenced is by both Western and Eastern art. Kapoor got international fame as one of the artists in a new generation of British artists in the early 1980s, together with such Geoff Bunn, Tony Cragg, Richard Deacon, Antony Gormley, Bill Woodrow and Richard Wentworth. Most of the Kapoors artwork consists of simple geometric, curved lines. A combination of these forms with bold colors and sometimes pure pigment. Well-known in Sweden, his sculpture Mother as a void - a giant, lying eggs with cropped top in which one sees only darkness. Since the late 1990's on, Kapoor worked in concrete. He is also famous for its gigantic, 155-meter works Marsyas (2002), which is installed in the entrance hall at the Tate Modern in London. It consists of three steel rings are covered with a dark red PVC; the two ends of the steel rings are vertical and the middle one is horizontal. He is born under the zodiac pisces, who is known for Fluctuation, Depth, Imagination, Reactive, Indecisive. Our collection contains 37 quotes who is written / told by Anish. "It's precisely in those moments when I don't know what to do, boredom drives one to try a host of possibilities to either get somewhere or not get anywhere"
"Re-investing in one's own little moments of insight is very important"
"I, in the end, make art for myself"
"Being an artist is a very long game. It is not a 10-year game. I hope I'll be around making art when I'm 80"
"We live in a fractured world. I've always seen it as my role as an artist to attempt to make wholeness"
"Maybe the way we have learned to look has changed in the last 25 years, and the exotic is much more acceptable. There are many artists now, younger artists, who work out of the exotic"
"I've always felt that if one was going to take seriously this vocation as an artist, you have to get beyond that decorative facade"
"I feel the symbolic world is the nub of a problem for an artist"
"Artists don't make objects. Artists make mythologies"
"Work grows out of other work, and there are very few eureka moments"
"The work itself has a complete circle of meaning and counterpoint. And without your involvement as a viewer, there is no story"
"Red is a colour I've felt very strongly about. Maybe red is a very Indian colour, maybe it's one of those things that I grew up with and recognise at some other level"
"One doesn't make art for other people, even though I am very concerned with the viewer"
"I think I understand something about space. I think the job of a sculptor is spatial as much as it is to do with form"
"You know that day after day of, Oh God what am I going to do with myself feeling? The fear of the emptiness that it implies keeps me going"
"The eye is a very quick instrument, much quicker than the ear. The eye gets it immediately"
"One does not set out with the idea that I've just had a great idea and now I'm going to go and carry it out. Almost all art that's made like that doesn't go anywhere"
"One can hardly be Indian and not know that almost every accent, which hand you eat your food with, has some deeper symbolic truth, reality"
"I feel there's everything to do yet"
"I am Indian, and I'm proud of it. Indian life is mythologically rich and powerful"
"A work will only have deep resonance if the kind of darkness I can generate is something that is resident in me already"
"What interests me is the sense of the darkness that we carry within us, the darkness that's akin to one of the principal subjects of the sublime - terror"
"My first show sold within the first 3 minutes, and I came back to the studio and spent the next two and a half years making almost nothing"
"Much of what I make is geometric, and has a kind of almost mathematical logic to the form"
"If you get a bad review, you take that in your stride"
"I'm not an artist who has an agenda that's set by the work"
"There's something imminent in the work, but the circle is only completed by the viewer"
"One of the great currents in the contemporary experience of art is that it seems to come out of the experience of the author"
"One must not believe any of those mythologies about oneself as an artist"
"One does afford oneself the luxury to come into the studio and all day, every day, spend one's life making aesthetic propositions. What an immense luxury"
"My work is not about my life history. It's not about the story of my neurosis"
"I used to empty the studio out and throw stuff away. I now don't. There will be a whole series of dead ends that a year or two down the line I'll come back to"
"Content arises out of certain considerations about form, material, context-and that when that subject matter is sufficiently far away"
"All ideas grow out of other ideas"
"One cannot set out to make a work that's spiritual. What is a contemporary iconography for the spiritual? Is it some fuzzy space?" "It's the role of the artist to pursue content"